View More In Shampoo Basins & Trays. Disabled Bed Shampoo Inflatable Tub Basin makes Handicapped Hair Washing fast and comfortable it's head and shoulders above the rest. 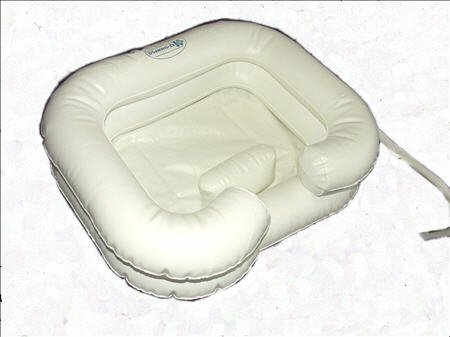 The unique MedAme.com bed SHAMPOO inflatable basin fills the need for an easy, refreshing shampoo for patients confined to bed. When inflated by mouth or air pump, the specially designed MedAme bed SHAMPOO tub is a secure, form fitting basin that comfortably cushions the patient's neck and shoulders. A conventional drain hose efficiently removes soap suds and water from the basin. All that's required for cleanup is to towel dry the rinsed out sink, deflate, and fold up for prompt storage in a space as small as a folded towel. It's that easy! If you have any questions about this product by EZ-Access, contact us by completing and submitting the form below. If you are looking for a specif part number, please include it with your message.